The Health and Wellness Committee invites you to a discussion with author Alan Bingham regarding Hospice and End of Life Care. When faced with limited life expectancy how do you plan your time to best advantage? What do you need to know to plan the last months of life to manage your time as best you can? How do you share this information with loved ones, how do you engage them and how can you be sure your wishes are followed when you can no longer supervise them? 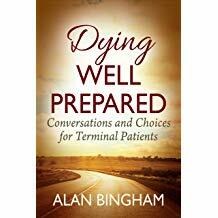 Alan Bingham is a retired hospice and palliative care executive who has spent many hours with terminal patients and their families.